Disclosure: An ARC of this book was provided to me by Harlequin Special Edition publisher Harlequin via NetGalley. This rating, review, and all included thoughts and comments are my own. The Double D Wild Horse Sanctuary is like a beacon of hope slicing through the dark morass of psychological trauma for war veteran Cougar. The sanctuary could help him, give him access to what he needs to try to calm the horrors and ease the ravages of the mental break he'd suffered after serving his tours of duty. It would let him work with horses again. Cougar lived and breathed horses. He hadn't even turned into the drive of the place, though, when the preternatural sense inside him rose up and collided with a flashback of hell. He slammed his foot on the brake, his truck stopping just before he hit the small boy who had dashed out from the side of the road and gone down in front of him. Once his tremors were under enough control to let him move, he opened the truck door and slid out straight into the lives of a young boy with his own traumatic past, one that's left him deaf and mute, and the boy's mother, whose haunted eyes full of crushing guilt touch a place in Cougar he thought long eradicated by the horrors of war. Celia Banyon could deal with her ex-husband, as odious as he is, and she can deal with the responsibilities of making ends meet as a single mother. She couldn't deal with the thought of her son suffering anything more because of her. When the man named Cougar - just Cougar - stepped into the barn and into her life, she of course felt the stirrings of attraction, but it was in the gentle kindness he showed her son that Celia saw his heart and soul, his calm compassion, and his many, many wounds. She saw a man who should be lauded as a hero, but who thought of himself as broken. As they draw closer, as their lives brush against one another in a way that fits so sublimely, Celia will have to convince her brave cowboy that he's more than what he sees in the mirror, more than the nightmares that rip him, screaming and sweating, from sleep. For her, for her son, he is so much more. He could very well be everything. This was a gently sweet romance with a few truly wonderful moments. I liked Cougar quite a lot. His PTSD was well-developed in the narrative without overwhelming the whole of his character, and he was a strong romantic lead with the sort of strength of character and quiet intensity that fit well with his role. His self doubt, his struggles with his past, and his concern for his future provided an inner conflict that added depth to his character in the book. Celia was less appealing to me as the female romantic lead. She fit well as Mark's mother, but the chemistry between her and Cougar felt a little tepid to me. She felt a little tepid to me in general, actually. Scenes that could have illustrated her spirit and strength (which any single mother has in spades, even without raising a child with special needs), instead made her seem too non-confrontational, especially those in which she faced off with her ex. Because of that, she came off more as a shadow than a siren in the romance arena. There's nothing inherently wrong with that, I guess, but it gave her character a submissive feel that I don't care for in my female romantic leads. My favorite parts of the book were the scenes with Cougar and Mark. Cougar's calm presence and his subtle support of Mark were fantastic. The way he drew him out and helped him find himself was beautiful to read. Mark stole my heart in the book, and he and Cougar made me smile watery smiles. The writing style gave me some problems. The dialogue between several of the characters seemed oddly truncated at times and lacked a natural conversational flow. The narrative, too, had a few passages that were sparse on explanation or description in some places. Several conversations flew over my head because of it and I had a hard time grasping the full impact of some of the scenes. In them, there seemed to be a lot being said beyond the words and actions, and I've never been easy with that sort of subtext storytelling. The romance between Celia and Cougar wasn't as effective as I hoped, either. Lack of much chemistry is hard enough to look beyond, but that problem was compounded by what seemed like a startling and sudden escalation in the relationship. The attraction the characters felt for each other didn't get much acknowledgement before the word love was being batted around - even if it was in internal monologue - so it felt like I had to jump gears from first to fourth instead of being drawn along with a naturally evolving relationship. 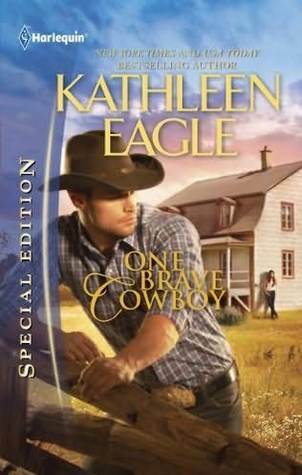 One Brave Cowboy is definitely a sweet story and it touches on some serious issues in a nice way. I enjoyed the idea of horse therapy and the attention drawn to the struggles of raising a child with special needs. The dashes of culture from the Shoshone and Lakota nations were also nice to see and lent legitimacy to the characters. I wouldn't say the book breaks any new ground in contemporary romance, and I felt both the sanctuary and the horses were underutilized, but despite the issues I had, it was an okay read with some truly wonderful moments.